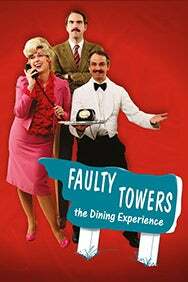 We do not curently have theatre tickets available for Faulty Towers The Dining Experience (Until 16 December 2017) This could be because we have simply sold out or it could be that this show is no longer running. The information on this page remains purely for historical and informational purposes. It doesn't replicate the TV scripts. Rather, its three performers inhabit the spirit of Torquay's most inept hoteliers Basil, Sybil and Manuel to a 'T', and you'll be caught up in their madcap melee even as you dig in to your 3-course lunch or dinner. This 5-star, critically acclaimed production has been in constant demand throughout Australia, Europe, Ireland, Scandinavia, the United Arab Emirates and the UK ever since its Australian debut in 1997. While it portrays the spirit of the TV characters and the atmosphere they create, please note that the performers are impersonators, and that the show has no connection to John Cleese, Connie Booth or their original scripts, or to the BBC.